Our 19' x 19' Boxing Ring is a Real KNOCKOUT!! Great for Backyard Parties, Church and Corporate Events. This Package includes 2 sets of Over sized Boxing Gloves, and 2 sets of Headgear. 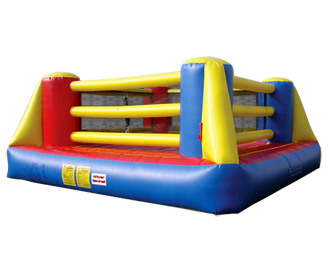 The Bouncy Boxing Ring can also be used separately as a Giant Jump, and can be set up indoors.